The third in the series is usually where superhero films come a cropper. After getting the origin story out of the way in the first film, and kicking up the action a notch in the second, the third always seems to go a bit awry. There's logical reasons for this happening: they range from the director of the first two departing, main character development running out of steam, using up all the good villains or even simply becoming a touch over-confident and throwing too much at the screen, knowing that it's your last shot with the property. So, this film has a lot of expectations to shift; even great film series tend to lose their lustre by this point. With this in mind it's important to note Iron Man 3 wears its 'threequel' status proudly - after all, when was the last time a summer blockbuster came out with an unadorned '3' attached to it? It can get away with this confidence, because practically every minute of Iron Man 3 is self-assured and most importantly, entertaining as hell. This is the fifth time Robert Downey Jr has played Tony Stark since 2008, and he inhabits the role so perfectly it's borderline impossible to imagine anyone else in the role (or for that matter, audiences getting tired of watching him). Stark is a charismatic and showy role that allows Downey Jr to really cut loose with his eccentricities: a skewed hero, but nonetheless one with obvious reserves of determination. He was easily the best thing about The Avengers and arguably, the dramatic lynchpin and popular centre of the multi-billion dollar Marvel film franchise. The only fly in the ointment with Tony Stark is that he seems to repeat the same dramatic arc over and over again. 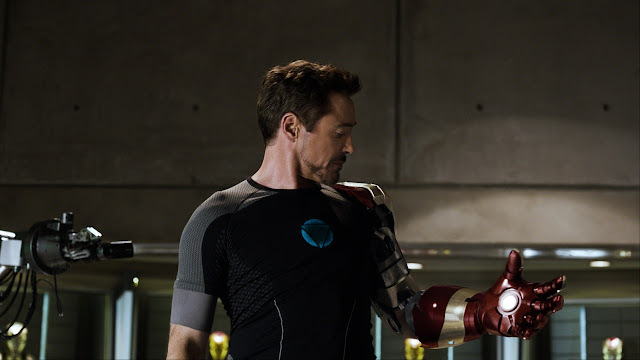 Watching a character learn responsibility and humility twice in a row cheapens him a bit, and though we got to see a slightly more mature Stark in The Avengers it suffered from much the same redemptive character cliches. Fortunately, Iron Man 3 begins right where his last appearance left off. This is a Tony Stark visibly altered by his experiences, physically and emotionally vulnerable in a different, complex and more satisfying way than before. This gives Downey Jr some new territory to play in, and it's novel watching Stark deal with problems that for once aren't self-inflicted. 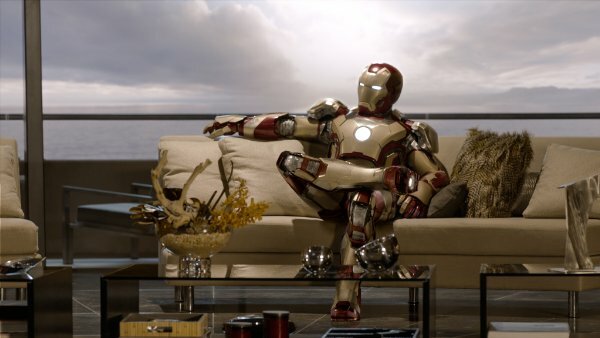 After the bombastic multisuperhero, New York destroying finale of The Avengers audiences could be forgiven for wondering whether going back to 'just' Iron Man in a film could be as satisfying. It is, both for the aforementioned character reasons, and because everyone else in the film acts like people probably would in the aftermath of New York being attacked by aliens - they never shut up about it. To Stark's chagrin it's all people want to talk to him about, and fighting aliens alongside a god before getting sucked into a transdimensional wormhole quite believably screwed up his head. But though Tony Stark sits at the dead centre of the film, the supporting cast are all given pleasantly meaty roles too. 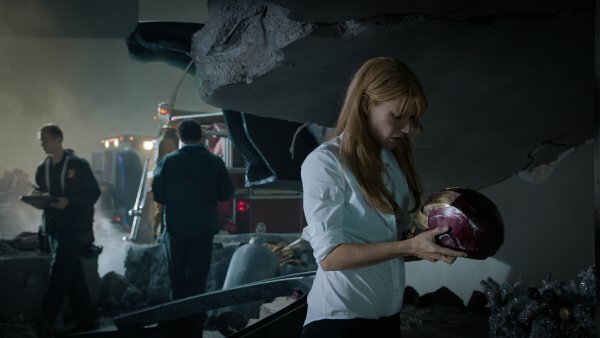 Those who've been in the franchise before, Gwyneth Paltrow's Pepper Potts (still a very silly name) and Don Cheadle's James Rhodes both bounce off Stark in a fun and believable way. Paltrow's Potts spends a little too much time as a damsel in distress for my liking, but the film goes some way to redeeming her in the final act. Rhodes, newly repainted as 'Iron Patriot' gets somewhat less room to develop, but his buddy cop routine with Stark absolutely shimmers, the chemistry highly reminiscent of the Val Kilmer/Downey Jr pairing in Shane Black's Kiss Kiss Bang Bang. But the absolute shining star here, killing it with every single line is Ben Kingsley. He's the villain, the weirdly non-culturally specific Mandarin. I can't really speak too much about his performance without spoiling things, but suffice to say, every line that comes out of his mouth is gold. He is by a country mile the best villain in the Marvel film franchise, subverting the audience's expectations in every single scene he's in. The villains in most superhero films are playing Whack-A-Mole; the Mandarin is playing chess. Ben Kingsley as the Mandarin. Quite possibly the greatest on screen comic book villain of all time. The subversion of expectations is what makes this so much fun. Shane Black takes obvious pleasure in leading us to believe one thing is going to happen, then pulling the rug out from under us. When the audience laughs out loud in this film, they are as much laughing at themselves as what's happening in the film. This light-hearted 'pop' tone is absolutely perfect for a summer blockbuster - the tone achieved throughout Iron Man 3 is what every other Marvel film has been trying to sustain. This light touch doesn't detract from the emotional pull though, the film makes a relatively straightfaced stab at portraying PTSD, suicide bombers and varying forms of grief and loss. The cast is so skilled and comfortable, and the script so intelligently written that it surefootedly dances the tightrope of between comedy action and straight action. The script also ditches much of the unpleasant libertarian politics that soured Iron Man 2. Tony Stark is still pretty much a Randian superman and much like the previous two in the series the plot ultimately boils down to a fight between two superpowered CEOs, but there's a lighter touch, one which successfully dilutes the right-wing power fantasy elements inherent to the character. These successes are largely down to Shane Black, who manages the impressive skill of imprinting his distinct directorial style onto a hugely expensive summer tent-pole blockbuster with an established aesthetic formula. The film isn't quite perfect though, it's a tad too long for one, with a mid-film sequence in particular dragging its feet. These scenes, where Stark is partnered with a precocious child sidekick never quite stray into the realm of the obnoxious, but they come pretty damn close. The film is never in danger of being derailed, but let's just say if you need a moment to pop to the bathroom go then. Also, in retrospect, the Mandarin's plan doesn't seem to make a huge deal of sense, but the film quickly papers over the cracks and relentlessly builds to a climax that's both outstandingly explosion-filled and narratively satisfying. The action throughout is zippy, kinetic and imaginative, no small feat considering we've seen three previous films exploring how to stage an action scene with the same elements. Black freely jumbles the Iron Man action components into unpredictable configurations, the effect being that Stark never feels invulnerable when inside his suit; he's always forced to rely on quick-thinking rather than technological superiority to pull through. This film comes pretty close to my vision of an idealised summer blockbuster. It's a jack of all trades: a perfect balance of comedy, action, science-fiction and character drama that should please pretty much anyone that watches it. I've been pretty middling in my opinion of Marvel Studio films; I tend to see them as fast food films that play it as safe as they can with the property, taking as few risks as possible. Iron Man 3 is my favourite Marvel film by far - don't be under any illusions that's it's a ground-breaking piece of cinema - but by the standards of the superhero genre it's quite outstanding. 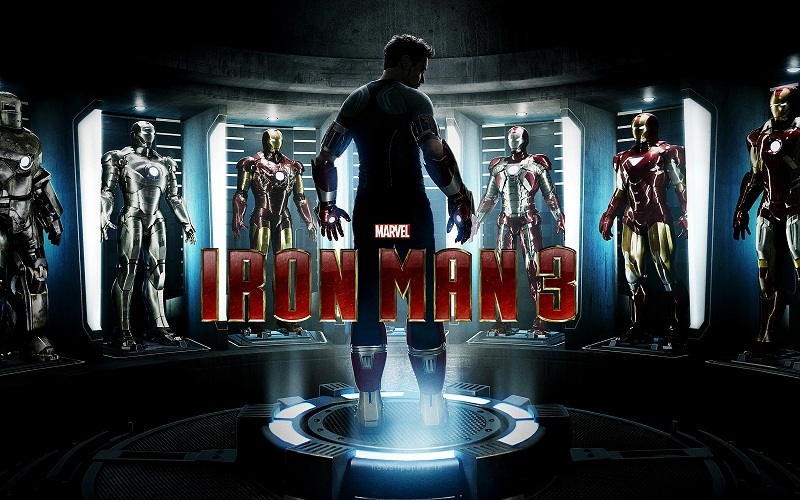 Iron Man 3 is on general release from 26 April in the UK, and on the 3rd of May in the USA. April 19, 2013 at 1:22 AM This comment has been removed by a blog administrator. April 19, 2013 at 1:33 AM This comment has been removed by the author. Comment deleted due to spoilers. the fifth time hes played iron man? It's short and inconsequential, but I'm counting the cameo in The Incredible Hulk, so that makes it five times including this film. Thanks for the compliment btw! Better than Avengers? Awesome. Thanks for your review! I actually think the evil plot is quite obvious. But that's because I got an extra clue from the prequel comic released before the Avengers. That the Ten Rings is made up of unconnected terrorist cells who have nothing in common with each other. With nothing binding them as a group except that they get money and weapons from the same one source. Knowing that, watching IM3 would explain what Mandarin was after. I don't think it's a question of backstory or being confused by who's funding whom. The thing is, the mechanics of the villain's plan are straightforward enough, but trying to work out what they want to achieve by it is a little more obscure. Have you seen the film? Just watched the midnight showing. I've to say the screenplay was very well written although the storytelling was rather heavily influenced by Nolan brothers. film to kick off the summer. Into Darkness you are next!